From kindergarten to college, a kid's gotta eat (and eat well) if they're supposed to make it to the top of the class. We've got healthy packed lunch solutions, fast supper strategies for hectic weeknights, easy DIY snacks your little scholars will actually want to eat, and hundreds of other recipes to help make heading into a new school year feel more manageable than manic. Traditional no-bake cookies get a flavor makeover with the addition of granola and dark chocolate cocoa powder. Enjoy 26 of our favorite make-ahead bag lunches, great for packing in kids' lunches or getting you through the workday. Don't forget your superhero lunchbox! Ban the boring lunchbox with these fresh, kid-approved ideas for deli meat. Get the Recipe: Hummus and Turkey Pinwheel Sandwiches Get more naturally delicious ideas! 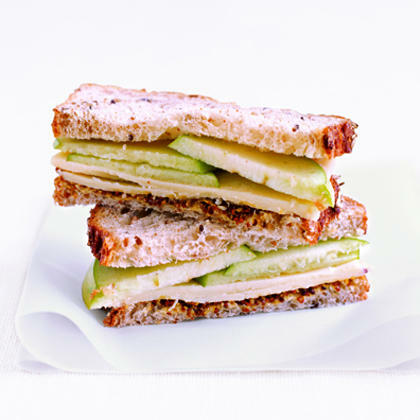 Keep it simple with easy sandwich recipes that have 5 ingredients or less. Busy weekdays have got nothing on these hearty, last-minute sandwiches. From chicken salad to veggie sammies, these adult-friendly, packable lunches are actually worth getting excited about. Get ready for coworker envy, because they're all going to be salivating over your new-and-improved sandwich game. A homemade mayonnaise spread studded with plenty of fresh herbs brings this deli favorite from tasty to over-the-top.Get the Recipe: Turkey Club Sandwiches with Herb Mayonnaise Get even more sandwich recipes! We took the best of two lunchtime favorites to create the creamy, salty, crunchy Egg Salad BLT.Get the Recipe: Egg Salad BLTs Get even more sandwich recipes! Who doesn't love a classic Reuben? Watch our video and learn how to make the deli favorite at home.Get the Recipe: Reuben Sandwiches Get even more sandwich recipes! This is not your average chicken salad! Fresh rosemary and smoked almonds add depth of flavor that can't be beat. Get the Recipe: Rosemary Chicken Salad Sandwiches Get even more sandwich recipes! What can beat a 7-in-1 appliance? Instant Pots are programmable and function as a pressure cooker, slow cooker, and rice cooker. It can also steam, warm, saute, and brown food. We've rounded up our best recipes created specifically for your Instant Pot, whether you're looking for a warm, comforting breakfast to wake up to or an easy and delicious large-batch soup to feed the whole family. Every recipe requires less than 20 minutes of prep; the Instant Pot cooks and keeps your food warm until it's time to eat. And for even more excellent Instant Pot recipes, be sure to pick up a copy of Oxmoor House's InstantPot Weekday Meals, on newsstands March 3, 2017. Ground beef casseroles are always a good choice for busy weeknight family meals. They’re easy, they’re quick and they won’t break the budget.